Solution #3 is possible with shaders that were just introduced in Solarus v1.6. Seem like more effort than it's worth to me. I suppose if you were strictly dealing with palette swaps, then it might not be too bad. I think it's also possible by drawing a surface of a particular color and using a blend mode. 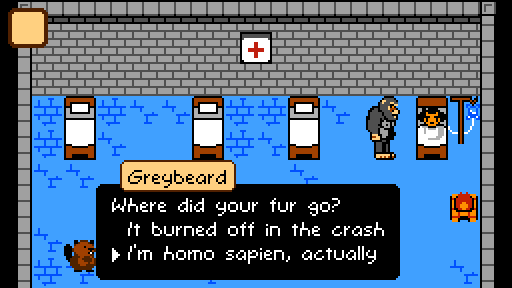 I'm considering including a 'photo' of the NPC in the dialog box (kinda like Golden Sun). This is making me question whether putting the NPC name directly in the dialog box is the best solution. Rather than switching between speakers mid-dialog, there could be separate dialogs for each speaker in a conversation, each with their own properties. I might change the way it looks later, just wanted to get it working for now. Some of my changes were stupid because I didn't fully understand the Solarus API when I made them. I'd like to go back and improve it. I implemented this in VOADI - thank you! I was concerned that it would be hard to merge with my existing script (I modified it from Christopho's original) but Meld made it easy to see the diff side-by-side and click the changes over. I'm excited to see the impact this feature will have on the quality of my dialogue. I'm surprised we'd never heard from this person before - I'm going to reach out to her. Going forward I'm going to use this thread to update the status of the bridge in case anything happens. I've updated the Telegram and Discord bridges. The Discord bridge looks to be taking a bit longer to actually apply the update though, and might be down for longer than expected. This is the longest period of time the bridge has been down since we first set it up December 9th. The rooms are still accessible to Matrix users, they just aren't syncing messaging to/from Discord. It's the first free 8x8 tileset I've seen that would be a good fit for Solarus. The only problem is that many prebuilt entities need to be 16x16 (including the hero). But you can probably get around this with a bit of hacking in the scripts. It would be interesting to see someone build a tiny game with this. Bugs & Feature requests / Re: Methods from OLB resources not working? Why does it say "no value" instead of "string"? 1. Quest data shouldn't be changed. It doesn't need to be changed. It seems like a bad idea that could introduce bugs. The quest files already give all the data you need. 2. Worlds shouldn't be shown in the file tree. Solarus 1.5's file tree did not reflect the actual filesystem, and in 1.6 there was a deliberate choice to make the file tree reflect *real files in the OS*. I think we should stick to that, because it's a good decision. 3. The world editor should be accessible from Tools > World editor. A dropdown of all worlds is generated from the quest data, and the user can switch between them. 4. The world editor can also be accessed from within any map, by clicking an "edit" button beside the "world" field. This would spawn a world editor tab with that dropdown already chosen. 5. The world editor should show all maps for that world, letting the user click and drag them to any position. 6. Single-clicking a map in the world editor makes it selected. The left sidebar shows that map's coordinates which can also be edited manually. 7. Double-clicking a map in the world editor opens a new tab with that map. 8. When maps are saved, the world editor is automatically refreshed. Please this!! It would improve map creation to the same caliber as multi-tileset support in 1.6.